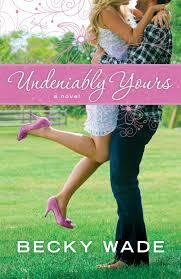 I was disappointed that I couldn’t snag a free copy of Becky Wade’s Undeniably Yours to review, but there’s always the library! Yay! I loved Becky’s writing in My Stubborn Heart and she has been nominated for some pretty awesome awards for that novel. Just rising to that level of awareness in this industry is an achievement in and of itself. The thing is, Becky deserves it. She writes phenomenal contemporary romances. Undeniably Yours is totally different from My Stubborn Heart. It is not a sequel but an entirely new story in its own right and written with just as much compelling drama and romance. Meg Cole had no desire to run her father’s oil business and had an agreement that for ten years she could do her own thing. His death shortened that dream and put her at the helm of a business she had no skills or knowledge about. With the advice of her many staff members, she starts by cutting costs and one of those cuts was the Thoroughbred racehorse farm that was her father’s pet indulgence. Bo Porter had worked hard in partnership Whispering Creek Ranch to make the Thoroughbred Farm a profitable venture and he’s just about to break even when the blow comes. He’s been fired and he has to terminate everyone, sell the horses and close the farm. Something about Mr. Cole’s daughter intrigues him though and he refuses her termination. He negotiates for six months in hopes that maybe she’ll change her mind. The last thing either of them anticipated was falling in love and the complexities that would ensue. Throw a sociopathic ex-husband into the mix and Oil “royalty” and you have one major adventure! With Bo’s job on the line and their relationship hanging in the balance, Meg seeks God’s guidance as to how to juggle the career she despises with the opportunities it provides. Danger lurks as Meg pursues her passions and finds that helping others puts her at risk. Undeniably Yours is a well-crafted romance with beautifully drawn out characters will keep you reading and rooting for Meg and Bo and Becky Wade doesn’t leave you wanting with her happy ending. This is a book I hope to read again.